Recently I was talking with my girlfriend who is studying Nuclear Medicine at the University of Findlay and she showed me all of the note cards that she creates for her classes. She goes through hundreds of note cards a week (25 Credit Hours) and she has to carry them with her wherever she goes so she can study. Me being the technologist that I am says that is a waste of tree’s, money, and time. I thought, there has to be a better way. There is. Cramberry. Cramberry is an online service that allows you to create note cards on the cloud and have them with you wherever you are. It’s easy to get started, head over to Cramberry and sign up for an account. There are 2 options for subscription, a free version that allows you to create 30 notecards a day, or a paid option ($9 a year) to create an unlimited amount of notecards. After you signup, you can get started creating your own notecards or browse others. A quick search for “Organic Chemistry” yielded over 63 pages of notecards. 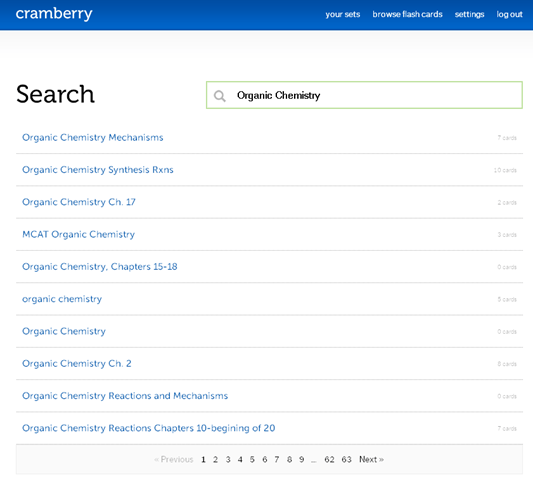 Cramberry’s intelligent studying algorithm tracks your progress and chooses flash cards you need to study. So you will always be studying the things that you have trouble with the most. Mobile- Cramberry offers an iPad / Iphone application that will sync your flash cards from the cloud onto your device so you can have them with you wherever you are. Studying on the go! How can we use this in K-12? Wouldn’t it be nice to create a set of note cards for the information that you have deemed important? Cramberry will help your students not only study the correct information but also study efficiently. Follow @cramberry on twitter for future updates! Do you know of any similar products that have helped you study? Let me know! Google Doc’s Blocked? Check out these resources. One quick clarification- in your post, you mentioned that the free plan lets you “create 30 notecards a day”. Actually, the limit is only on studying; you can create as many cards as you want. Thanks for stopping by! I love your product and I recommend it to my teachers all the time. I think its a great utility that allows teachers to create sets and students have access to them wherever they have access to a computer or they have their phones.